3 Posts in one Day - Curious and Curiouser! Well, I have been caught by the doodling bug. Here is another page from my new journal. 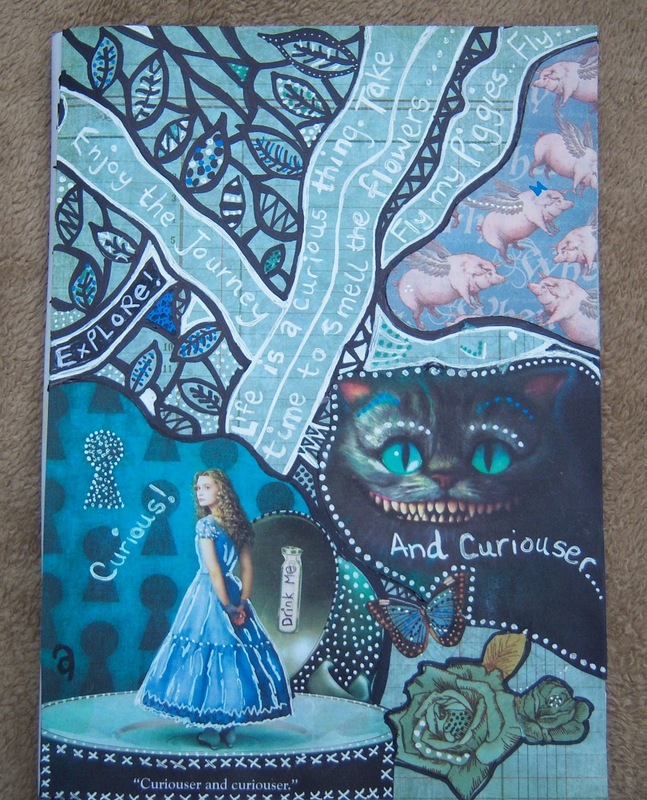 I drew and I doodled and I added to my 2 photo's (from postcards that came with the Alice in Wonderland DVD) and then, I doodled and dotted some more! I'm really enjoying drawing things like leaves freehand. 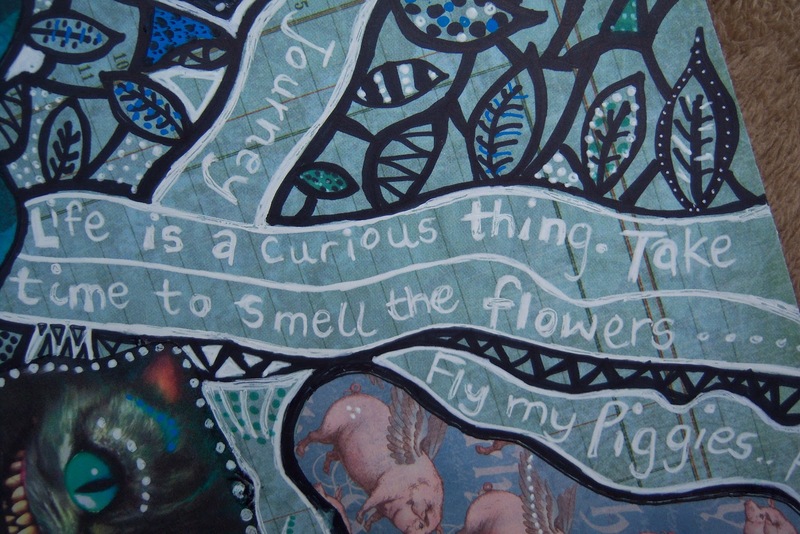 It was only after I took the pictures of my second journal page that I noticed something very curious indeed... I'd forgotten to do any stamping at all! My Daughter's ipod Drawing - New Shoes! - 2nd post of the day! 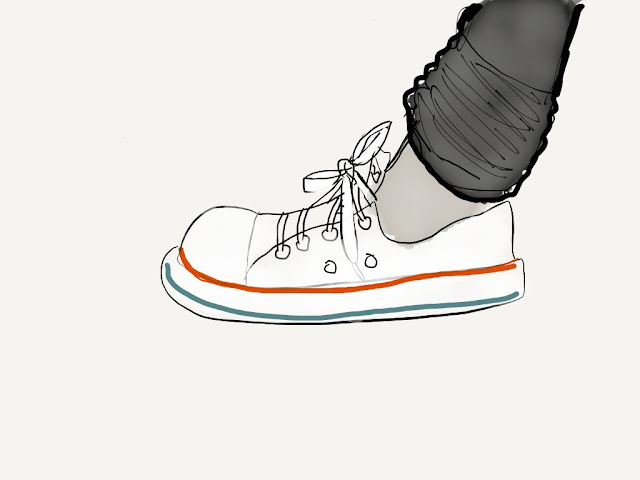 Yesterday, my 14 year old was bought a new pair of shoes by her dad. She wanted me to see them... so she 'doodled' one on his ipad and emailed it to me! This was only her second ipad drawing... and knowing her, took about a minute. I love em! she is so 'free' when she draws. 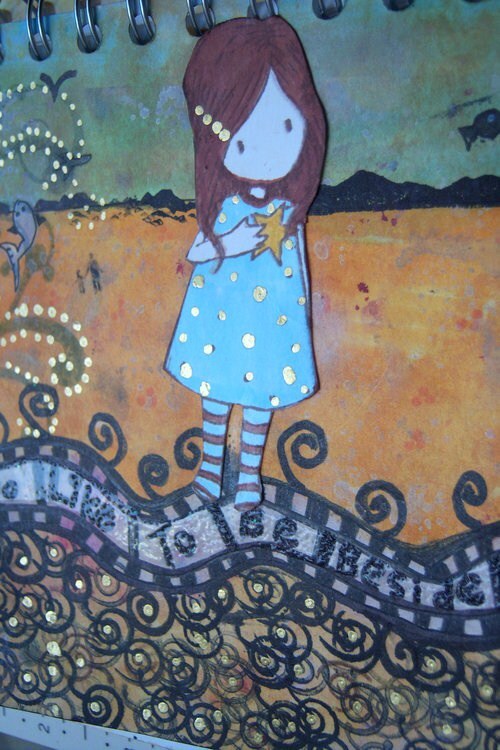 I think she should start a blog and blog her art... don't you? 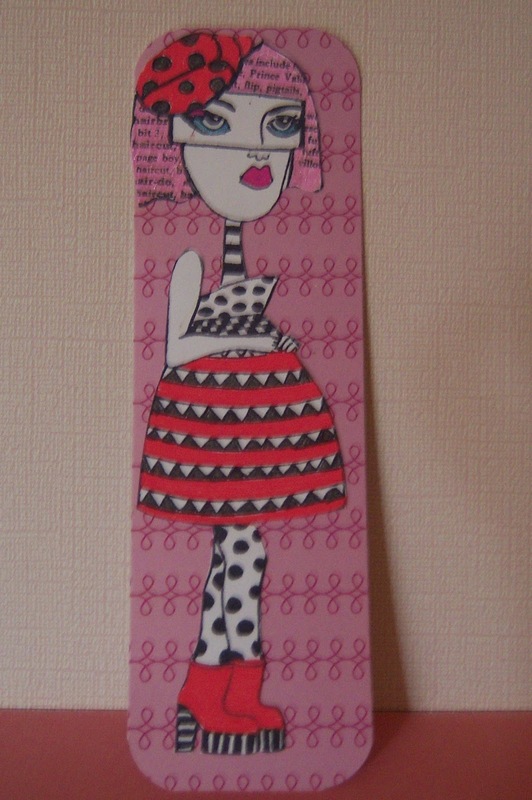 I cut out an image of a beautiful girl from a old magazine, added doodles and stamped images (the butterfly neckline) and put it on a beautiful piece of Graphic 45 paper. I love how blogging constantly gives me the inspiration to extend my boundaries. 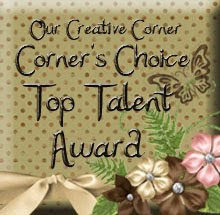 Inspired by seeing Dyan Reaveley's photo's from Ranger U on Suze Weinburg's gorgeous blog. Ranger U, Travelling Ruby Rainbow? Just a quick post, lots to do today and this weekend. This is the Birthday card I made for my friend Anita in America. She is getting inky at Ranger U as I type and I am very proud of her. 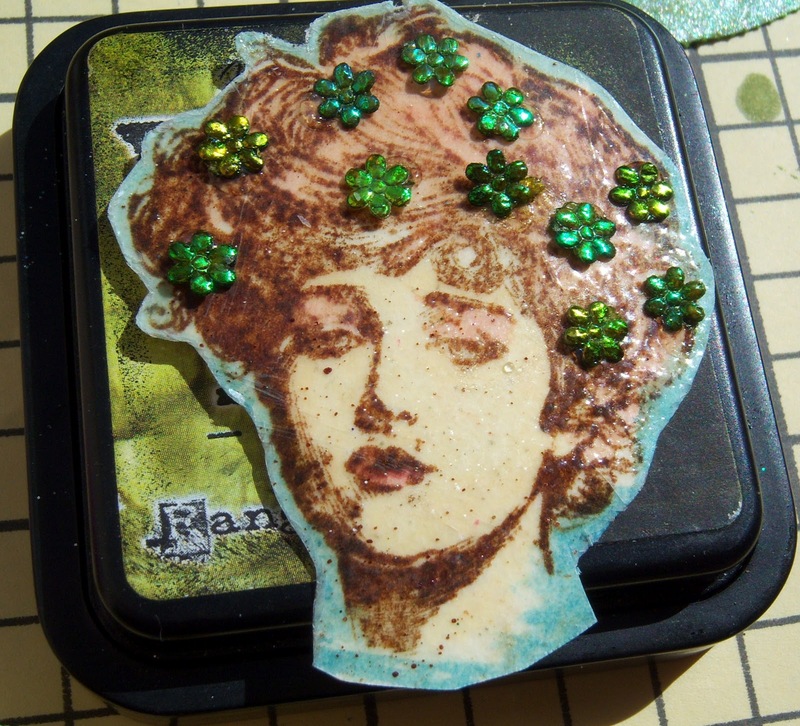 I used gorgeous Dyan Reaveley Stamps and my own foam flower stamp made from a Tim Holtz Die Cut (Yep! 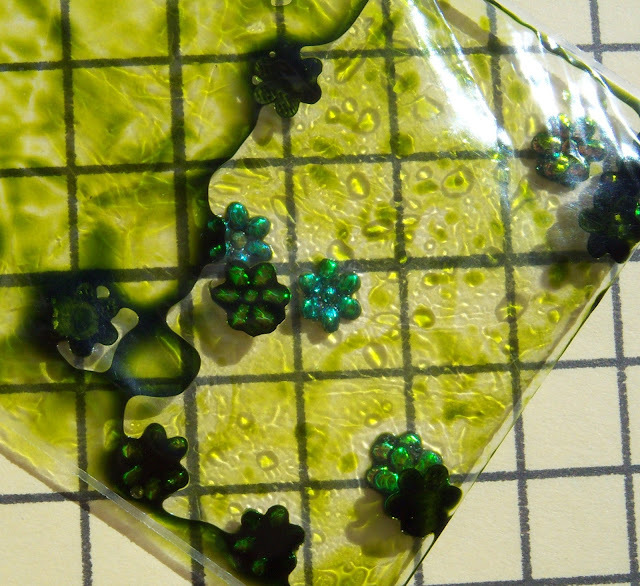 my beloved new Grunge flower die... again... If you can't buy often, buy well and get the use out of your stuff!) 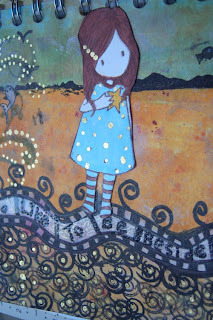 I doodled and kiss stamped my 'ever so useful' Rogue Redhead Designs Almanac background stamp and stamped flowers to create my background. Tho' the piccie doesn't show it so well, this is glittery and shiny as I Sakura'd and Stickled it to within an inch of its life! 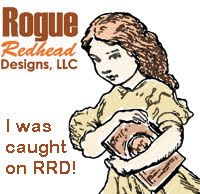 This week has been an odd one, so it cheered me up immensely to click on Rogue Redhead Designs during my daily travels through blogland and see... erm... one of my cards. 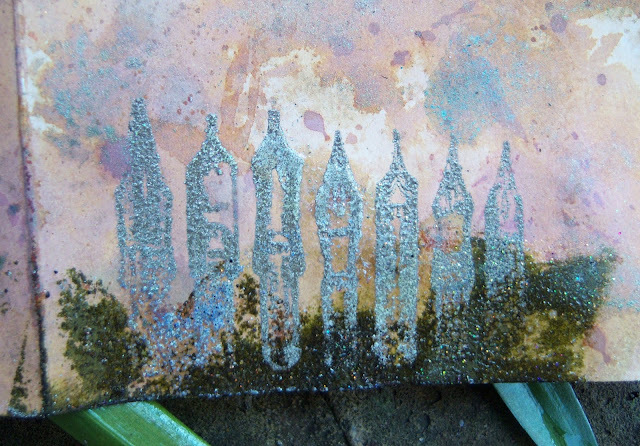 Thanks for featuring my work again Shar, it made me really happy. 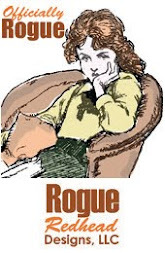 Rogue Redhead Designs Your stamps are brill! My very first altered tin! Do you like the title of this post? I do! I couldn't think what to call it, so I asked my daughter, who was watching me take photo's through the French doors and quick as a flash (and in her best Wicked Witch of the West voice) she suggested the title I used! Her sense of humour makes me giggle. 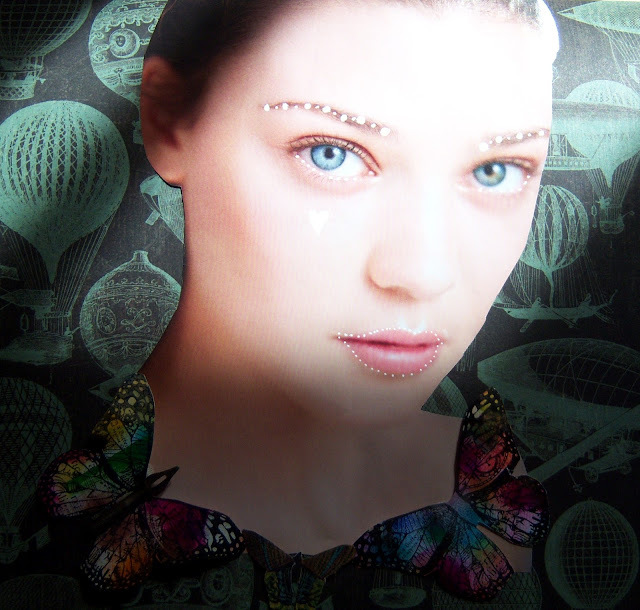 Luckily, my butterflies resisted the urge to 'leg it' (or should that be 'wing it?') and I managed to get my piccies! This started off as a tin of Marks and Spencers Peppermints which was painted in ordinary (well rather posh Farrow and Ball) emulsion paint and then sanded down and lined with Graphic 45 papers. 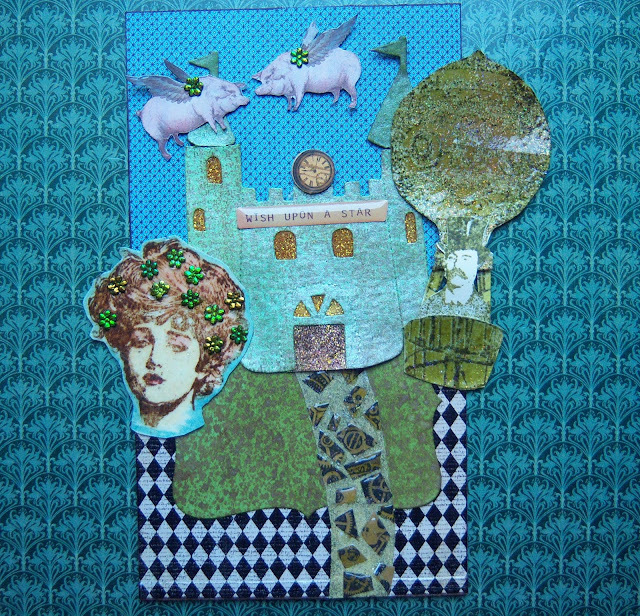 The background was made with triple embossed stamping (thanks to learning this during the 12 Tags of Christmas) using a floral stamp from Stampington. 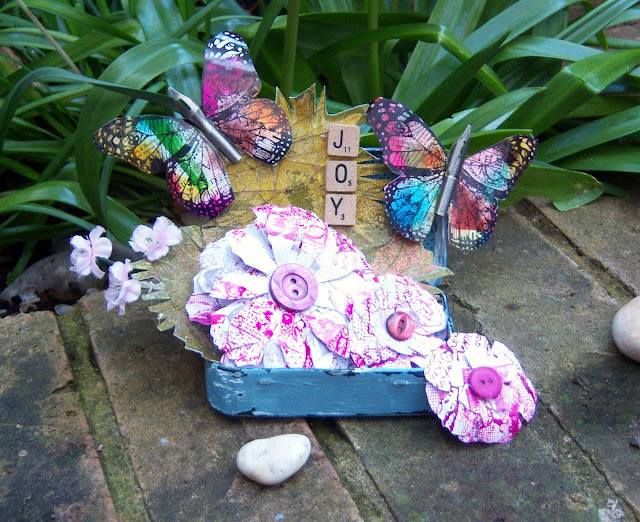 The butterflies were created as a batch and I was so happy with them. 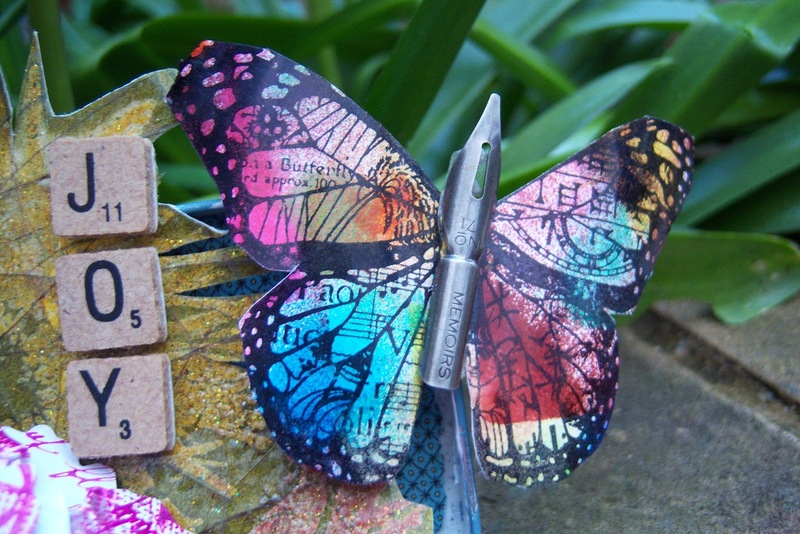 Ages ago I was trying out bright inks on photo paper (just pressing the ink pad randomly all over the page) and I created a masterboard of sorts, I was just playing and hadn't thought of a use for it until today, when it got recycled into butterflies. I stamped my butterflies all over this page, using a Stampers Anonymous Butterfly, cut then out and gave them pen nib middles. The pink and white flowers were stamped in Fuchsia Pink StazOn and then cut out using my precious new Grunge Flower Tim Holtz Die, which has made an appearance on virtually everything I have crafted since getting the die last week! The buttons were recycled from my stash - I collect buttons and always reuse where possible. 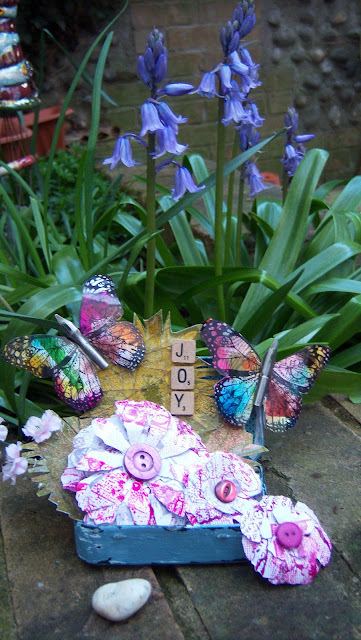 I liked the photo against my bluebells in the garden, the butterflies look quite real, even though the stamp gives a 'newspaper' effect. My 14 year olds first go at Drawing on an ipad! Els's self portrait on her dad's new ipad, this was her first go at using it and was completed within a few minutes of her getting her hands on it when he came to collect her the other day. Her father was an art student back in the day (the creative gene runs deep in her blood on both sides of the family) and I was pleased to see that he had started to draw again as well. I love this portrait... there is something great about 'first goes' at doing something new. It doesn't matter how something turns out, it is the excitement of a new challenge, a new media to play with. 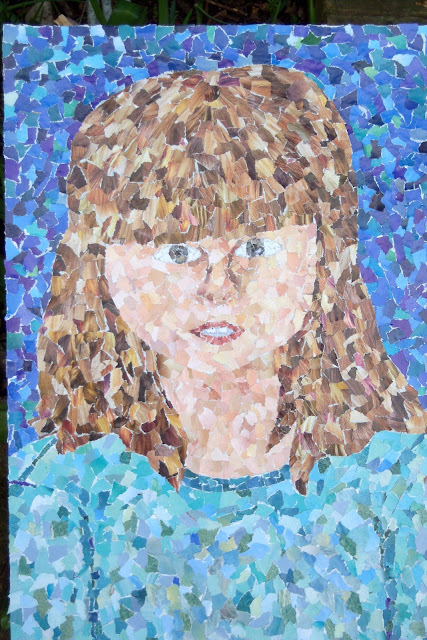 I love how part of it is realistic and part experimental as she played with texture and colour... well done daughter, you are far braver than me! 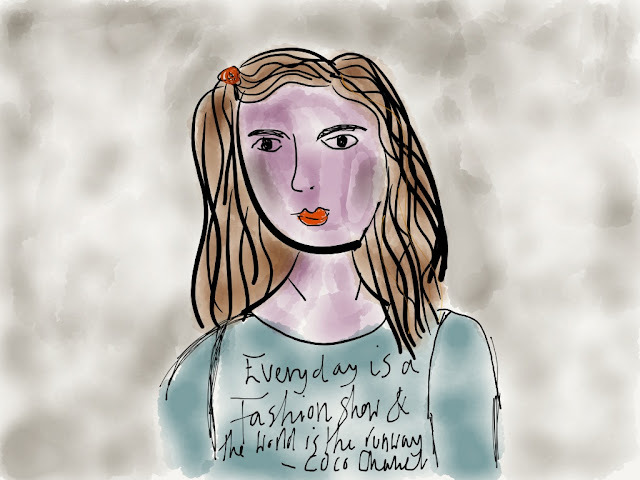 Eleanor has fallen in love with quotes to do with fashion and style (as can be seen by the quote she scribbled so elegantly on her tee shirt in the drawing)... she wants to incorporate them into a textiles project at school... If anyone knows any... please could you add them into the comments? The real thing! Pretty as a picture! I am one of life's natural recyclers, it makes me happy! 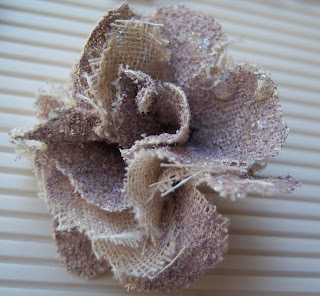 I have always loved recycling and there tends to be some form of repurposing in each of my projects. In honour of Earth Day 2012, this is a photo of a few of the bottles and glasses that I have painted. The small one holds nightlights. The bottles were painted to hold dinner candles. The gold, silver and bronze are actually outliners and the black is glass paint. 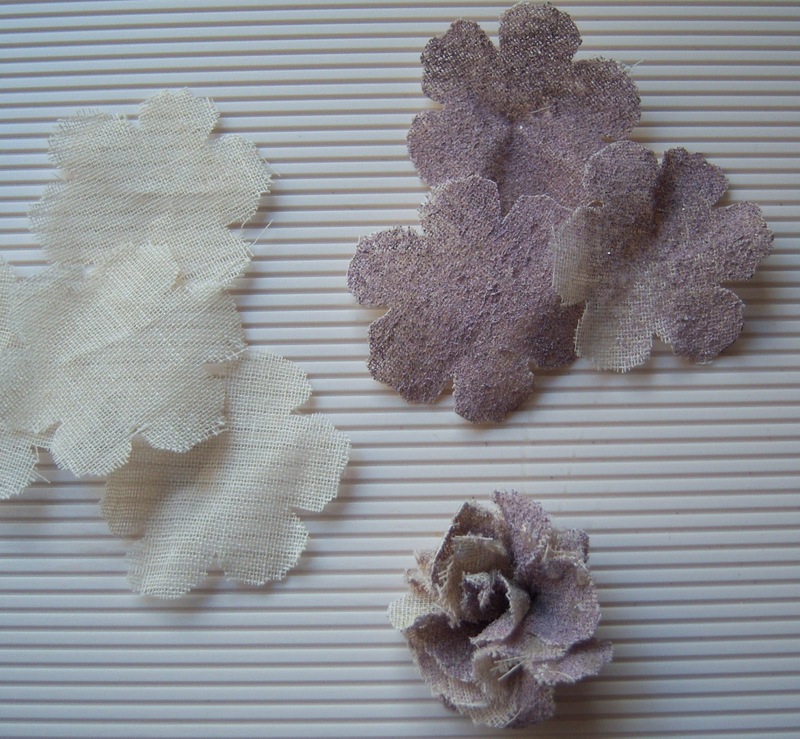 I am proud of the paper flowers - more makes with the Tim Holtz original Grunge Flower Die that I bought so recently. 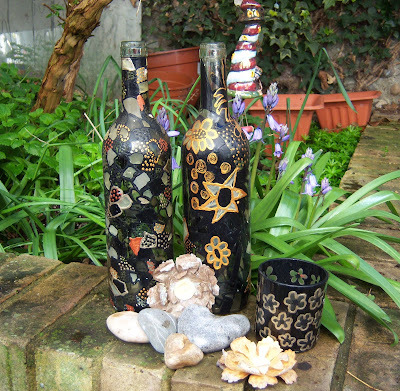 I once taught a week long craft course called 'Funk it Don't Junk It' using mainly things out of the recycling, coupled with a lot of PVA and Acrylic Paint. 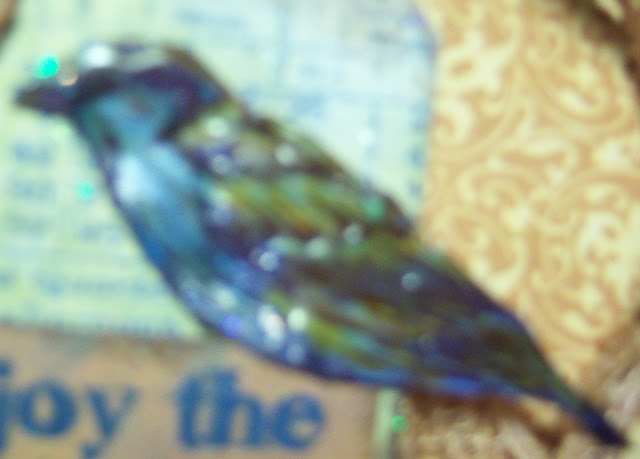 NEVER be put off by what you do not own when crafting... think about what you do have and be happy. It is so easy to want the latest thing, but it is also a lovely feeling to make use of what you have... Look after our planet... it's where we all keep our stuff! 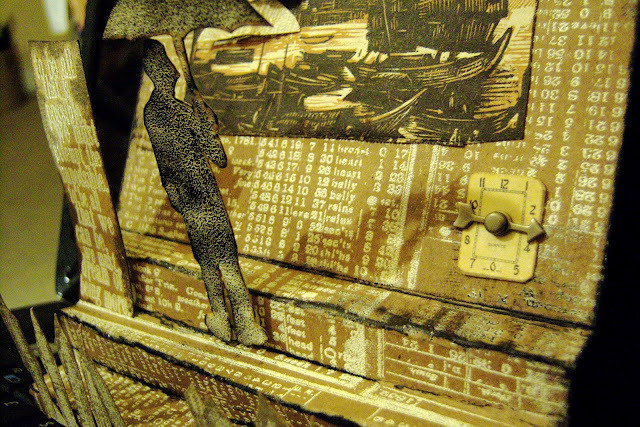 Isn't Tim Holtz's new website great? I love it! Over at Studio L3, the 'A Compendium of Curiosities 2 Challenge' has begun, celebrating techniques from Tim Holtz's new book. I can't wait to see what everyone comes up with! 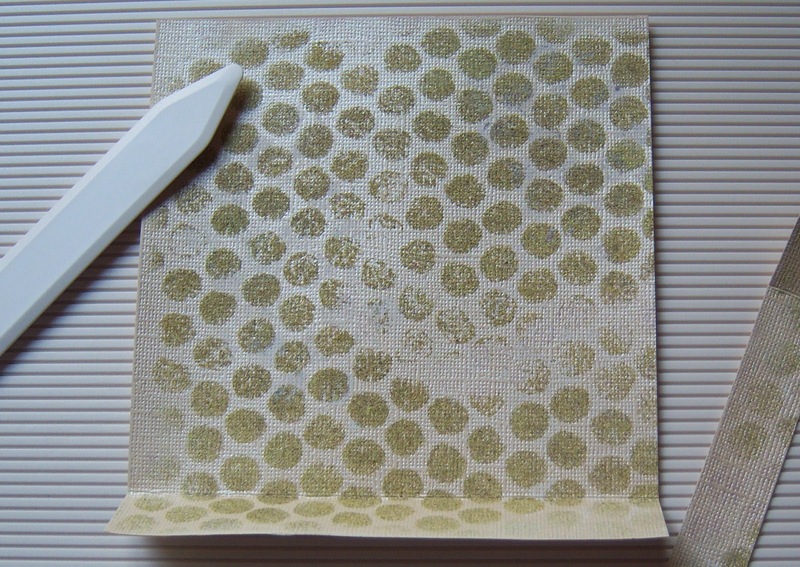 I used the foam technique on the original grunge flower die. Well, Travelling Travis only travelled part way onto this tag because I liked my inky background so much, I didn't want to cover it up too much. I used only 2 colours, Sakura gold and glittery silver pens.This is a really fun technique and I think I will use it again and again.. Out of respect to Tim, we have been asked not to detail our making on this one. 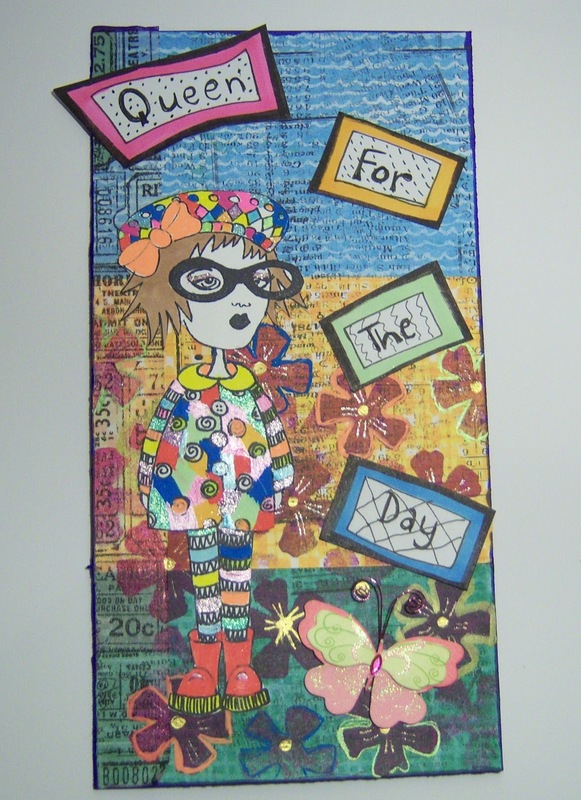 My exciting news is that I have won $30 for my entry into the Stampotique Designers Challenge - So I'm doing the Happy Dance AGAIN because I love their quirky stamps and so does my gorgeous 14 year old arty daughter Els. 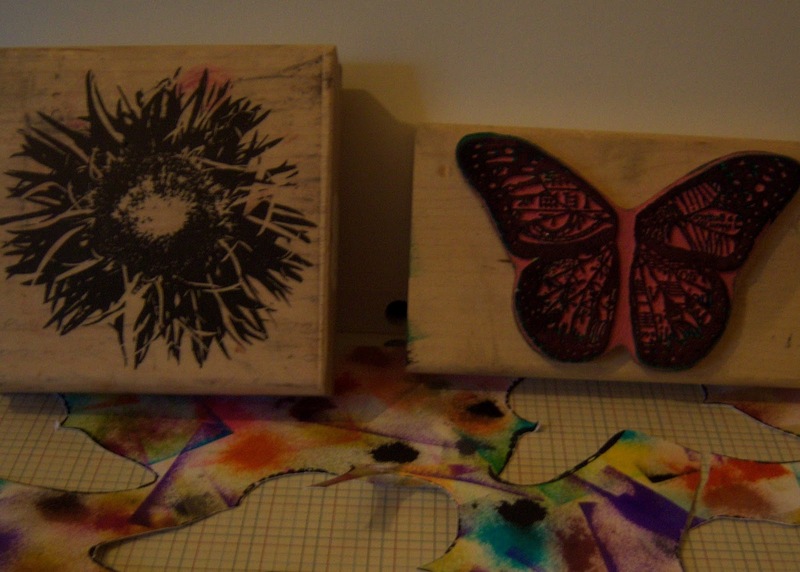 Who knew stamping would turn out to be so exciting? This is the second thing I've been fortunate enough to win something this week - one of my Tim Holtz tags was chosen to win the Fashionable Stamping Challenge. 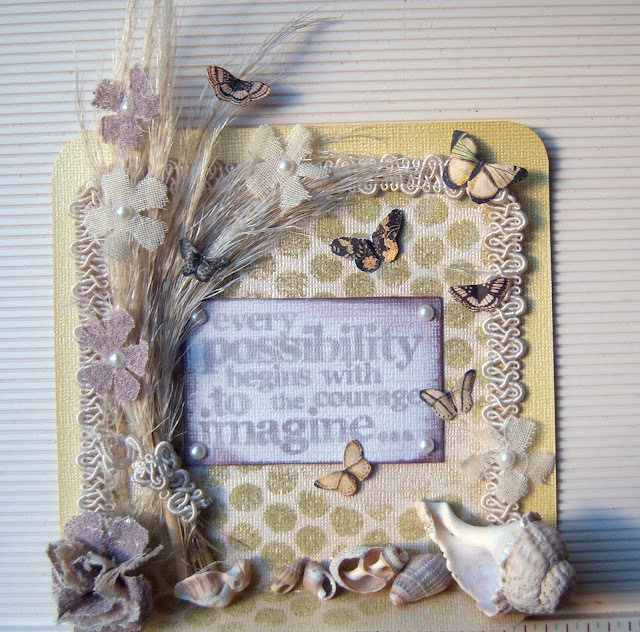 Blogging has certainly opened up a new world for me as well as improving my stamping abilities in so many ways. For the last couple of weeks I've been blotting ink from my projects onto the pages of a book (after seeing the Queen of journalling, Dyan Reaveley do this) and also trying out distress stains and watercolours on different pages. Today was the right day to try and make my first page. Isn't it exciting how blogging extends your boundaries and makes you aware of new possibilities? Where I live, there is a scenic railway close by that goes along the seafront - A Victorian Masterpiece and a true testimony to the spirit of Steampunk. 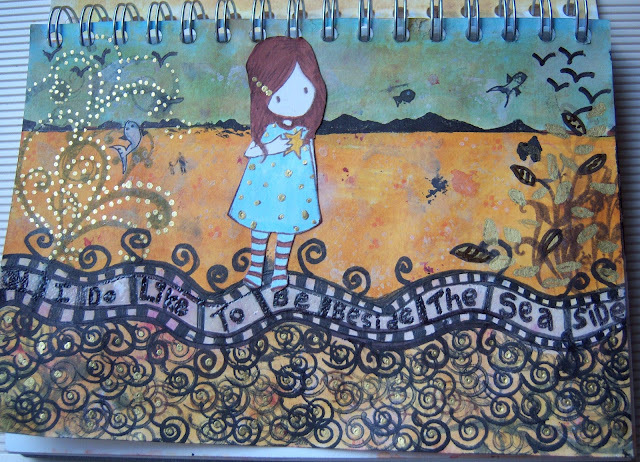 I love the sea, so, I have made a little wibbly filmstrip railway on my first journal page to contain my first journalling words. The girl is a Gorjuss stamp, but I changed the hair. There is lots of gold detail on the original, but, it doesn't show up so well in the photo. Most of the swirls that I used to create my plants and pebbles with are beautiful stamps from Close To My Heart and were a real joy to use and blended in with my doodling very happily. Okay...so I fibbed about the Kittens! but I was humming... 'These are a Few of my Favourite Things' a minute ago... which I was reminded of... by adding a few raindrops of Glossy Accents to the first ever grunge flower that I made myself. 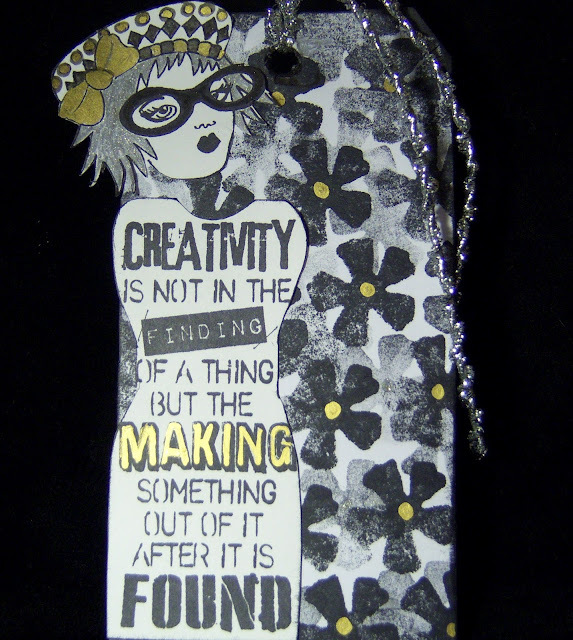 I finally (several years after most people) got the Tim Holtz die and I lurve it already! If you can't buy often, buy wisely when you do... and I did... and I'm so pleased with it!! After Umbrella Man's Grand Day Out (my last blog entry) I got some lovely encouraging comments and decided to wander further into the Land of 3D, well, texture and depth anyway. 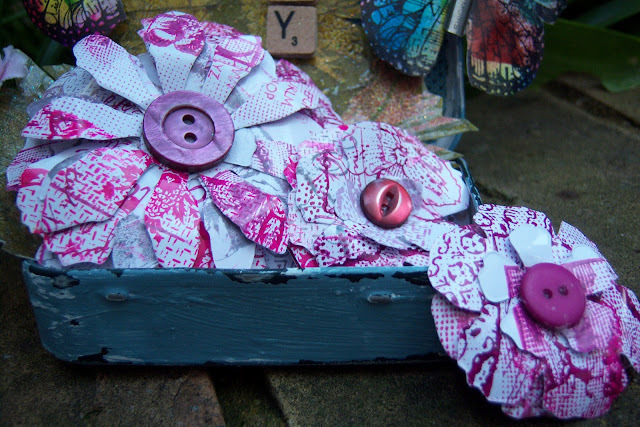 This morning, Hels Sheridan posted a gorgeous creation which had lots of embellishments on a little shelf, I liked this idea so much, I've incorporated a shelf into this piece. 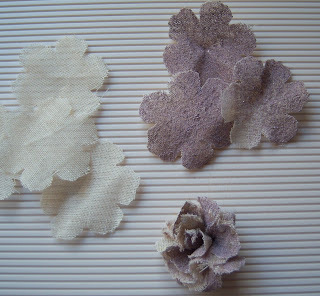 First of all, I cut a selection of flowers from muslin embossed using 'Milled Lavender Distress Ink. 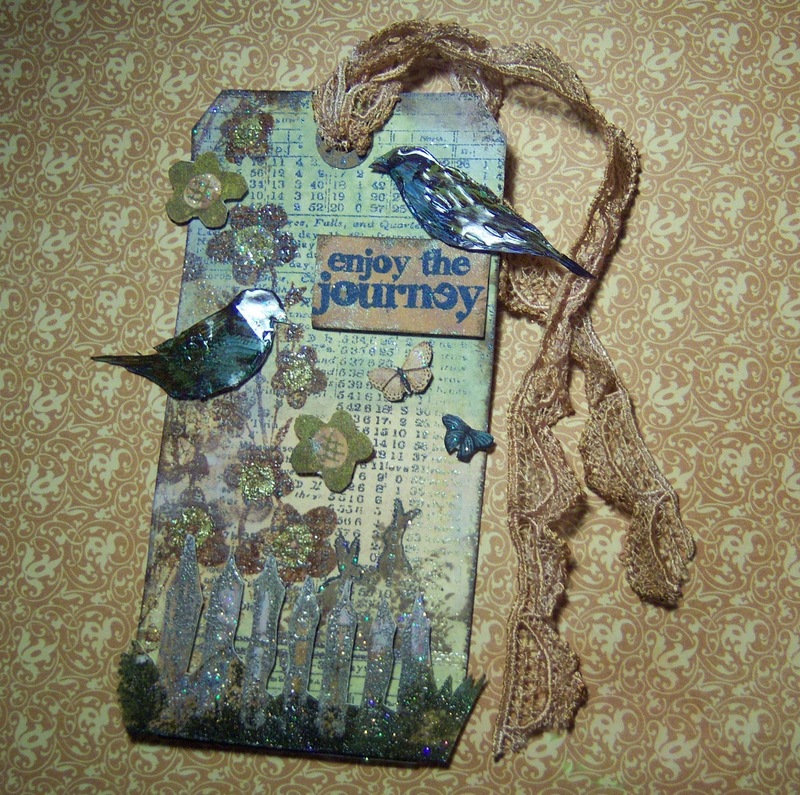 I stamped a Tim Holtz sentiment using a brown Memento Ink and Coredinations card, cut out some Graphic 45 butterflies and gathered together some tiny shells (and a big un which kept falling off). 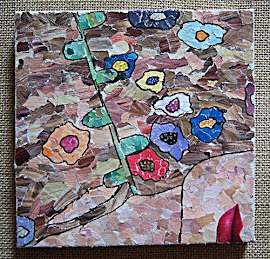 The sprigs of dried flowers on the left hand side of the card... my daughter picked up off the pavement the other day. The ribbon/lace was dyed with coffee and stuck down all around the edge with double sided tape. I had problems getting a final photo for this one, it was pouring with rain... and I had the board at an odd angle trying to catch natural light... the real card is straight... honest! Today, I ended up making something that's sort of 3D, I've never done anything quite like this before, so I'm really pleased with it - wobbly bits and all! I love my creations to tell a wee tale and this one is 'Umbrella Mans Grand Day Out!' His brolly is very appropriate for a day out on this blustery and wet Bank Holiday. 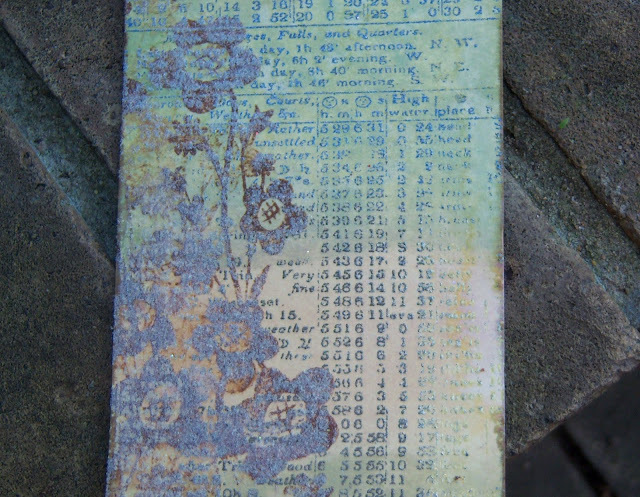 I used my Rogue Redhead Designs, Almanac stamp to create the background for the scene as it is also full of numbers. 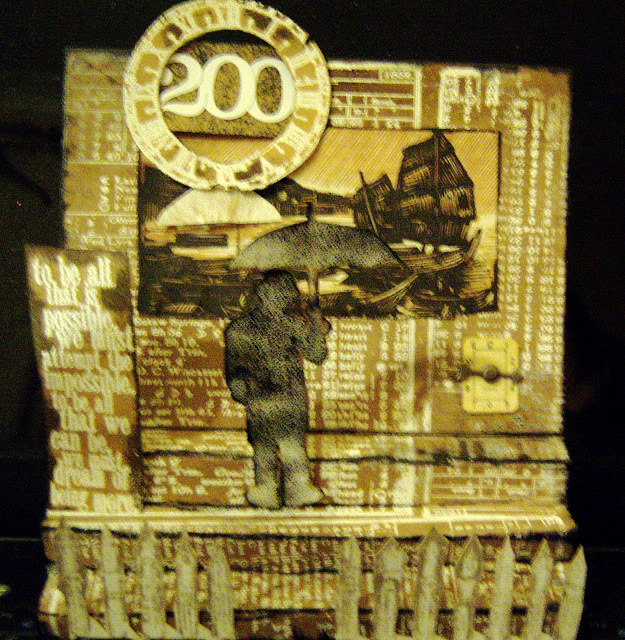 I made 3 mini steps from the front part of the card and edged them with black Memento Ink so that Umbrella man could stand under his brolly and admire the view across the bay. We have a giant Ferris Wheel on the Seafront about a mile from where I live and we also have a Marina close by, so are often treated to views of little fleets of boats bobbing by - I've even seen a few old sailing ships. I made 2 sets of Tim Holtz 'pen nibs' and cut them out to represent railings (I have lasting images in my head of seeing so many tourist sites in London through railings when I was little, especially Buckingham Palace) The nautical picture came from a very old French book that I tear up when I need text to add to my projects... I got it at a car boot sale, it was torn and coverless, so I don't mind repurposing it! Update...Here's my good news, I won! Last night I got such a thrill. I hopped (in Easter mode) over to Fashionable Stamping Challenges and found out that I had been selected to win the last Challenge (Spring is in the Air) with this entry:.. My Spring Tag I was doing the happy Dance in my flat, I can tell you! This is a site that I love so - take a look at the samples from their DT for the current nautical challenge (there is a direct link above this paragraph) and you will be see why! They are all gorgeous and there are a lot of them to enjoy seeing. 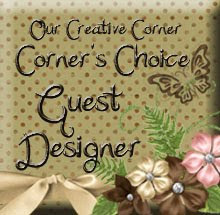 They are kindly sponsored each week by Cottage Crafts Thank you for making me so happy! 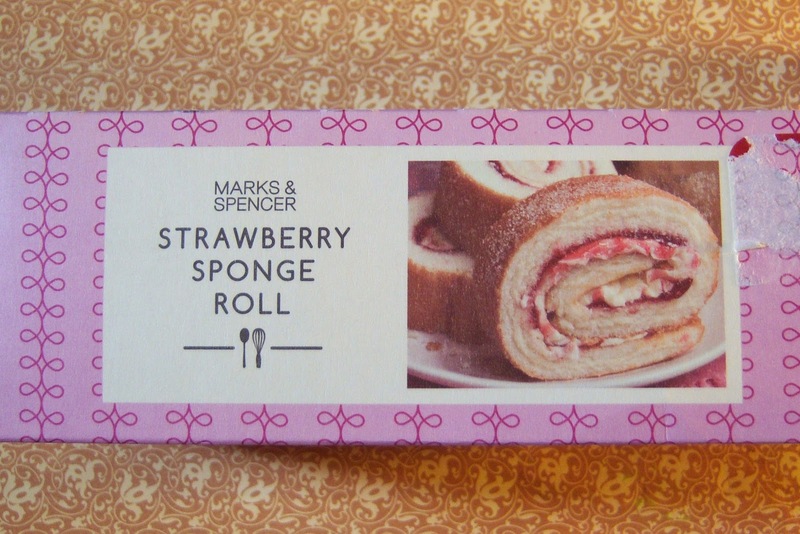 Yesterday, we had one of these lovely sponge rolls from Marks and Spencer. I loved the design on the packaging and it seemed too good to end up in the recycling. Bonnets not Bunnies and Bloggy Buddies! Whatever it may mean to you, a celebration of Faith, extra days off, chocolate D.I.Y, bunnies and eggs... or a combination of all of them! No step by steps today, I got so absorbed making this I forgot to take any piccies at all... well apart from the one you are looking at! 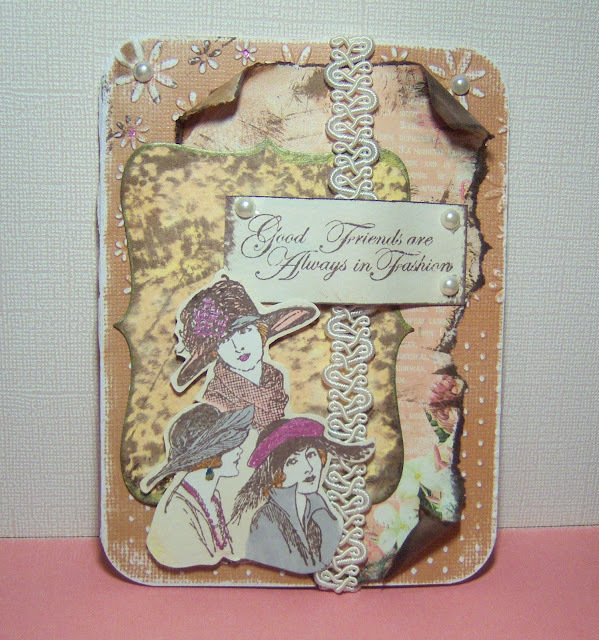 I used my gorgeous Rogue Redhead Designs, Milliner Misses stamps to create both the main image and sentiment... 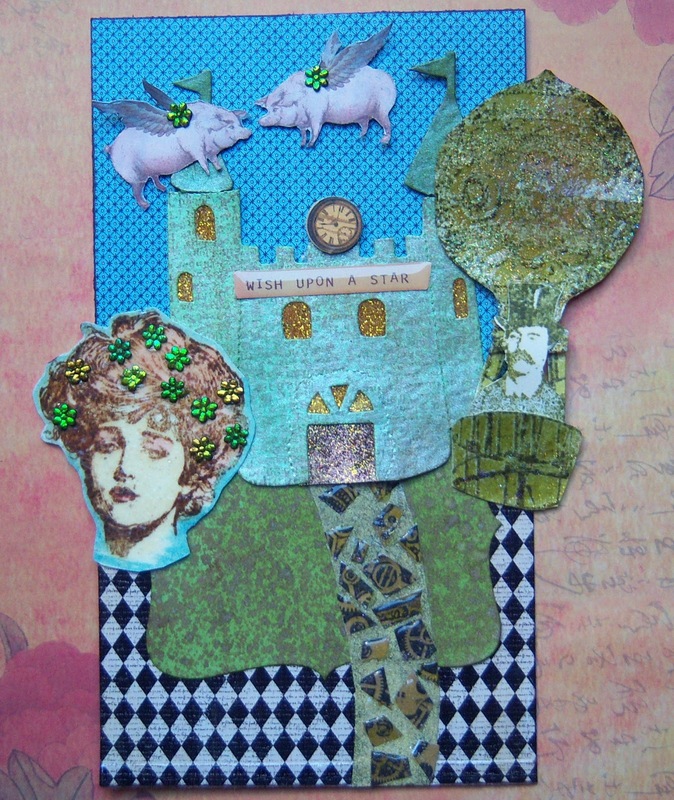 I couldn't decide which embossing folder to use on the background of the card, so I used 2 different ones!. The images were coloured with Promarkers and glittery Sakura pens. If anyone is alone today... I have extra hugs! 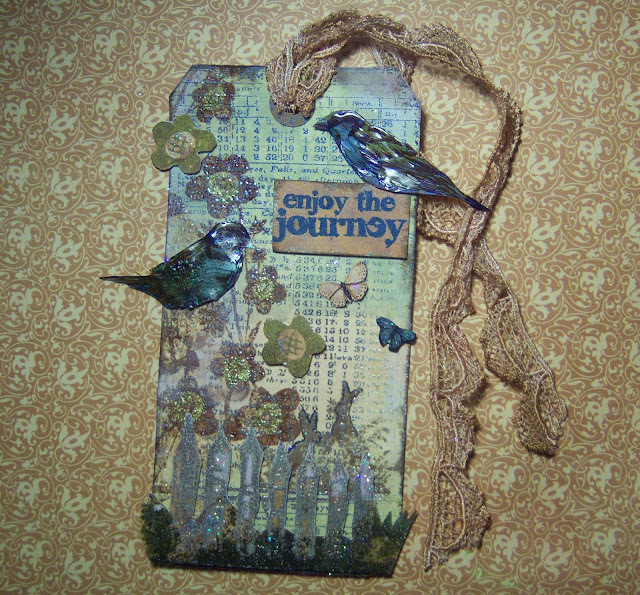 When I started to get out the bits and pieces to create this tag, I was hunting to see if I had a suitable bird stamp. I did not! For someone who loves stamping as much as I do, I am woefully lacking in the stamp department, however... I have ingenuity by the bucketfull! Instead I cut out 2 images from a scrapbook pad (they were a plain royal blue and black) and Glossy Accented them. 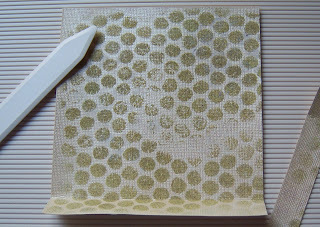 Part way through the drying process, I scored the wings with a needle to create a textured surface. Once everything was dry, I coloured with Promarker's. 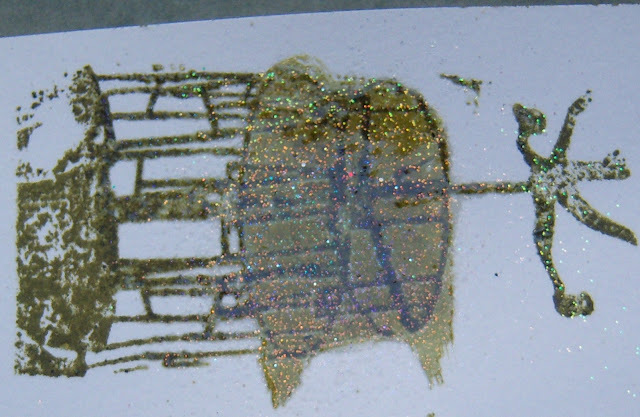 During my hunt, I decided that my Tim Holtz Pen Nib stamps reminded me a little of a fence and this igave me an idea for my tag. I knew I wanted to add lots of Spring things... I ended up with flowers, birds, butterflies and some cheeky little Indigoblu bunnies (again, a freebie from Craft Stamper magazine) that snuck in there at the end. I also used lots of different stamping techniques which I really enjoyed - it is lovely to be able to create my own backing papers... most of this, I have learnt from blogging - thank you all! After lightly rubbing a plain tag with Vintage Photo and Broken China Distress ink, I used my favourite background stamp, the Almanac from Rogue Redhead Designs and Versamagic Sugarcane Ink to create a text background. I couldn't decide which embossing inks to use from the selection I had chosen, so I used all of them in different parts of the tag (Holographic, Clear, Dark Brown and a Faded Jeans Distress ink) I water splattered the tag and rubbed Frayed Burlap Distress Ink around the edges to close the tag. Trying to show the glimmer! 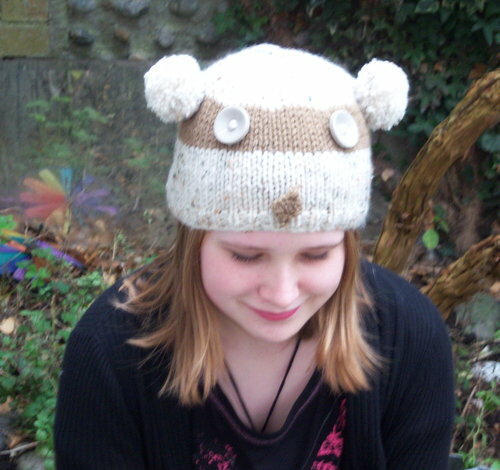 As ever, I had such fun making this! Another beautiful day down on the South Coast of England... Spring! Even the word fills my heart with joy! 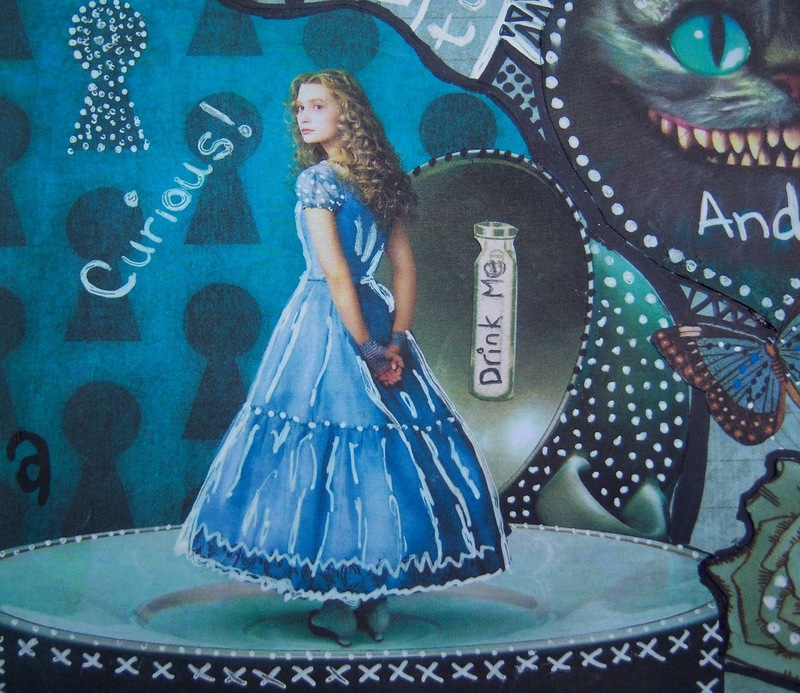 Somewhat influenced by the Graphic45 site, where I read childhood memories relating to the Wizard of Oz, I watched the film whilst crafting - you may notice a slight influence on this project! I also have very happy memories of doing a long tour of the Wizard of Oz around England in the late 90's when I worked as a Wardrobe Mistress in the Theatre. While crafting, for no apparent reason, I found myself imagining how a 1950's TV presenter would have given the instructions for part of the project, perhaps during 'Womans Hour' If you can manage the clipped 'received pronunciation' that was 'de rigueur' on British Television during this period when reading the next paragraph... it works well! 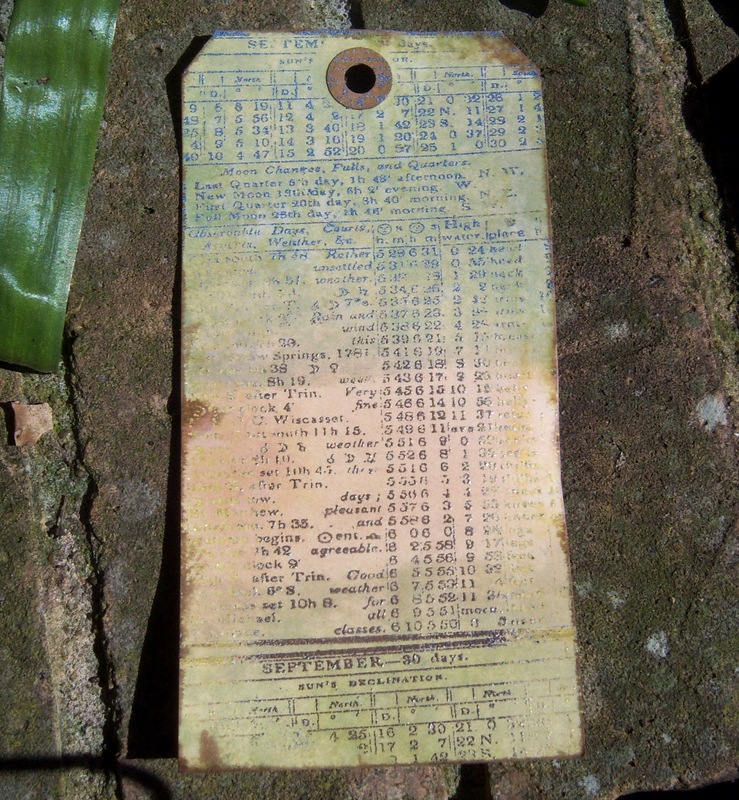 Ah, Halcyon days indeed! And yes, I do know the Wizard of Oz had flying monkey's not pigs... I started this off in black and white (sort of) and then moved into brighter and brighter colours - Just Like The Fillum! Anyone who has this Graphic45 paper will know it's green - very green - not according to my camera though! You look like a balloon basket ! Come with me!